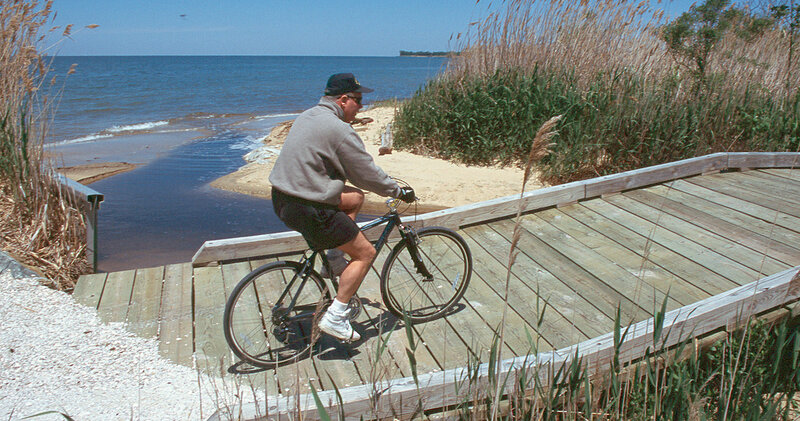 The six-mile Cross Island Trail traverses the northern part of Kent Island east to west. Walkers, runners, and bikers weave through pine tree cover, open fields, and commercial areas to find a public green space at either terminus. Terrapin Park to the east, Chesapeake Heritage and Visitor Center, and the abutting Ferry Point Park to the west, bookend the trail and are both worthy of a visit. With much to see and experience at either end, how should one plan their day to ensure they see it all? Consider the visitor center a base camp for your adventure. The center provides both a generous amount of tourist information and a pleasant roadside diversion. Have a snack on one of the picnic tables on the campus lawn before your trek, and enjoy uninterrupted views of the Chester River. One can almost imagine the land as it once was, untouched and undeveloped. At one time, the marshy grassland of Kent Narrows was shallow enough for bathing and was commonly known as “the wading place.” Now, two dredge barges relieve the Chester River of its excess sediment, making way for next season's increased boat traffic and storm water run-off. To the south, the Kent Narrows bridge expanse casts a shadow over the waterway leading to Prospect Bay. Marinas and boat repair businesses line the borders of the property. From here you can, jump on your bike or lace up your shoes for a six-mile trip east to Terrapin Park. The path is flat and paved unless traversing one of the trail's wooden bridges. Trekkers can enjoy views of the bay and the western shore from Terrapin Park Beach. It's also likely visitors will catch a glimpse of the park's resident wildlife. The trail loops around the outer edges of Terrapin Park and sends you back to the visitor center. On your return to the center, wander inside the visitor center, and stroll through its modest museum collection of traditional Eastern Shore memorabilia and respectable amount of scientific artifacts. Antique duck decoys, models of oyster boats, and the nippers watermen used to harvest oysters are nicely presented here to browse with or without younger company. There are also displays at the museum sure to engage young fossil hunters, future marine biologists, environmental scientists, or archaeologists. A set of drawers displays an enlightened look at the region's geological and archaeological history. A nearby glass-enclosed shelf displays Native American wampum beads, a form of currency made from bone, ancient tools, and archaeological finds. Be sure to open the antique refrigerator. The shelves are stocked with marine fossils from Calvert Cliffs State Park, one hour south on Maryland's western shore. The display itself is a novelty. Behind the visitor center, a boardwalk bridge stretches over some wetlands and a field of golden bay grasses. Follow the path and the signs to Ferry Point Park. You will know you're getting closer when the rhythmic whirring of trucks and cars crossing the Kent Narrows bridge dulls to a murmur. Low tide at Ferry Point Park reveals tracts of rippled sand beach. A row of seagulls wade in a line at the water's edge. Grassy dunes and pines outline long stretches of sand. Plentiful, preserved recreation space still exists on Kent Island, even after decades of expansion and change. Go to the island to bike, hike, wade, discover, dig in the sand, and appreciate the environment. One could easily while away a whole day. The Chesapeake Heritage & Visitor Center helps visitors discover the many sites to visit in the region. As a regional information center, Center staff can assist visitors with directions, information and visitor services. Terrapin Park sits on 276 acres of Bay front land north of the Chesapeake Bay Bridge. The park includes over 4,000 feet of shoreline and 73 acres of wetlands, making it a destination for nature and wildlife enthusiasts. A 15 mile trail across Kent Island, the largest of the Chesapeake islands, this flat paved biking and walking route takes travelers from the open Bay to the west past significant wetlands and other landmarks. 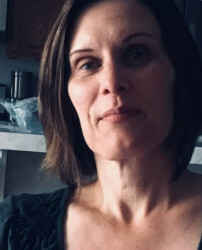 Brenda Wintrode is an award-winning, free-lance writer who specializes in arts and entertainment features. She has an affinity for meaningful one-on-one conversation, engaging podcasts, experiencing the plenty of nature, and exploring new places. She loves to travel with her family, hike, and kayak. National Cherry Blossom Festival: The Nation’s Capital in All Its Blooming Glory!